. : Trail Running Adventures :: Ski XCOttawa.ca :: Skiing in Ottawa and Gatineau Park :. 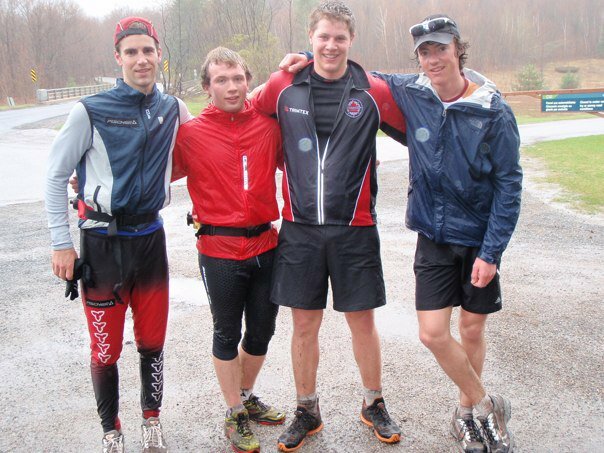 I was inspired to post an article on trail running after stumbling upon an fasterskier article (http://fasterskier.com/2010/07/run-in-the-off-season-and-youll-fly-in-the-ski-season/) , where XC Ottawa alumni, Ed McCarthy, made some rather interesting but very true points about trail running. Ed stated that, trail running is very specific training for a cross-country skier where your pace and heart rate profile would be similar to ski workout or race. As in, you have to push hard up and over the uphills, maintain your speed/tempo on flats and learn to recover on the downhills. It sounds simple but it makes sense and made me realize why I seem to enjoy it more than road running. I am also far from a natural runner so anything closer to cross country skiing is more my style. 1. - No repetitive pounding on the pavement where injuries can occur. 2. - Can build ankle and knee strength while also improving balance. 3. - Far more can meet the eye. For example, wouldn’t you want to run into a bear rather than some old car going down the road – i.e. way more exciting! 4. - Also a mental workout. You have to be totally focus and dialed in to nail that perfect line running down a steep hill. 5. - A workout that can be surprisingly enjoyed in the rain! Epic runs on wet trail in the mud are awesome. 6. - And from my experience running shoes dry way faster than ski boots. 7. - The achievement of over coming a mountain or reaching a remote location in the forest can make training way more fun. We could all add to the list and its not to say the road running is no good, but for the cross country skier the bottom line is trail running is not only a great ski specific workout but as well very exciting and fun for any level of athlete. Here a few photos of only a few of my favorite places to run at home during the summer. I hope this is encourages you all to get out and get a little mud on the shoes! Typical weather for me to choose trail running for a workout. Running across a section of barren land in Labrador. Sometimes no trail is the best trail. Log bridges are always fun to cross. The way trail running shoes are suppose to look like! The Gatineau park offers a lot of sweet trail running. This one was taken early this spring, where a few XC Ottawa teammates got together with new Carleton ski Coach Chris Mamen for a epic day on the trails. We were a little ambitious and our first run of the year topped out at 2.5hrs and 18km in the mud and rain. All smiles at the end! Just remember every paved road comes to an end and that’s where the real adventure begins!